This factsheet is based on a collective report submitted by CESR and a coalition of 36 Spanish civil society organizations submitted to the UN Committee on Economic, Social and Cultural Rights (CESCR) at its 63rd session in March 2018, for the 6th periodic review of Spain. It examines the enjoyment of economic and social rights in the country. This factsheet focuses particularly on analyzing the impact of austerity measures on the right to an adequate standard of living, the right to health, sexual and reproductive health and rights (SRHR) and the right to work, between 2012 and 2017. 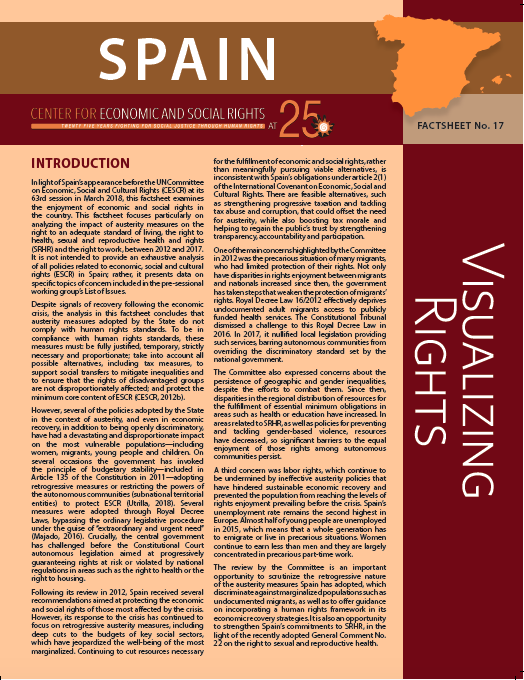 It is not intended to provide an exhaustive analysis of all policies related to economic, social and cultural rights (ESCR) in Spain; rather, it presents data on specific topics of concern included in the pre-sessional working group’s List of Issues. This factsheet concludes that austerity measures adopted by Spain do not comply with human rights standards and have had a devastating and disproportionate impact on the most vulnerable populations—including women, migrants, young people and children. The central government has also invoked the principle of budgetary stability to adopt retrogressive measures and restrict the powers of the autonomous communities (subnational territorial entities) that protect ESCR in areas such as the right to health or the right to housing. Following the country's last UN CESCR review in 2012, Spain received recommendations aimed at protecting the economic and social rights of those most affected by the 2008 economic crisis. Spain has continued to focus on retrogressive austerity measures, including deep cuts to the budgets of key social sectors, which have jeopardized the well-being of the most marginalized. This factsheet explains that there are feasible alternatives, such as strengthening progressive taxation and tackling tax abuse and corruption, that could offset the need for austerity, while also boosting tax morale and helping to regain the public’s trust by strengthening transparency, accountability and participation.